If you’re vegan, I bet you’ve heard this question plenty of times. So how do you answer it? You could focus on the health reasons: you don’t want to be one of the 2.7 Americans with heart disease, and veganism is demonstrably healthier than an omnivorous or lacto-ovo-vegetarian diet. Or perhaps you just can’t look past the ethical or environmental implications. Whatever your reason, be prepared to justify your decision. Over and over and over again. That’s usually the first reaction to telling a family member or close friend that you’re vegan. They’ve probably witnessed your transition from meat-eater to vegetarian, so it shouldn’t come as a complete shock to them. But maybe you went from burger connoisseur to tofurkey fanatic overnight, or maybe they’re especially unobservant, or maybe this has been a long-standing argument that they’re just waiting to pick. Not the protein question AGAIN!? Don’t make yourself an inconvenience. I know, your reasons for going vegan are probably complicated. It’s not a decision that most make at the drop of a hat. When they ask "why? ", answer their question as calmly and succinctly as possible. It’s an open-ended question, yes, but they don’t actually want to hear the whole answer. Otherwise, you might be accused of “ranting.” So, pick something simple, and answer quickly. If they’re still curious, and they ask further, then feel free to elaborate. Why this level of caution? In case it’s escaped your notice, vegans don't have the best reputation. No matter what your reasons are for deciding to go vegan, they’ll feel less judged if you don’t continually bring it up. They don’t want to feel less environmentally-conscious, unhealthy, or less concerned for animals. But, inevitably, when you explain yourself, you’re drawing a comparison between you and who you used to be - an omnivore, like them - and they feel like you’re passing judgment. So, keep it short and sweet unless probed. This is the face I make at people who annoy me. Most people don’t think about the fact that nearly every meal they consume has some sort of meat or animal byproduct in it. Actually, not only are there animal products in the meal, the meal usually centers around meat. This is obviously an issue for omnivores when they invite anyone with a vegan diet over to eat, which makes up a large portion of social interactions. This can be a bit of a pain on both ends, but you can gently ask what they would prefer. Would they like for you to bring a dish, eat something beforehand, or give them a vegan recipe? If they have a preferred option, go with that, and don’t feel guilty. If you’ve made your dietary choices known, then you’ve done all you can. Furthermore, going out can be complicated, especially if you are traveling and aren’t familiar with local cuisine. 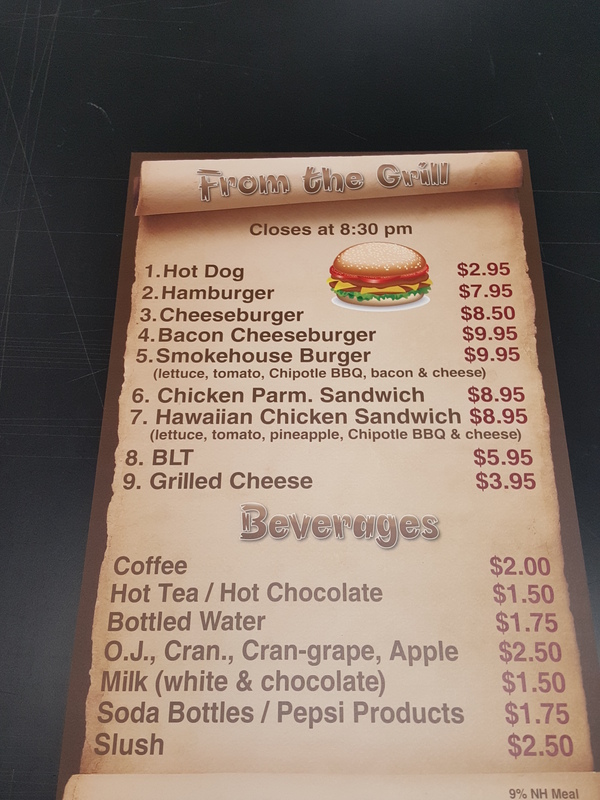 This is a menu at a typical fast food outlet, where many of your traveling companions will want to grab a bite at the airport or bus station. See the huge lack of vegan options? Even when considering more diverse menus, a huge part of traveling, whether it’s across the state or across the globe, is trying local specialties. Luckily, there are ways to work around that; you’ve just got to plan ahead. Don’t make a big deal out of going to certain restaurants. Bring your own vegan snack pack to fill you up if nothing at the restaurant hits the spot. Recommend or ask for places that might be more likely to include vegan options, but don’t ruin your friends’ experience while doing so. Yes, you shouldn’t be inconvenienced either, but you can make do. You won’t convince anyone to become vegan, or even vegetarian, if they feel alienated by you. You know how you joke with your mom about her porcelain doll collection, or your friend’s insistence to always do the math on sales tax? That’s what they’re doing to you. Of course you might be the victim of some malicious jabs, but generally they’re just trying to poke fun. Do not overreact to this. In general, the more chill you are about your veganism, the more chill they will be about it too. Of course, this is just a guideline rule. Some people are too headstrong and oblivious to deal with your veganism in an appropriate way. If that’s the case, drop them, and move on. This can be especially scary in a foreign country, but I promise that there are plenty of exciting people to meet and experiences to have with them! Different hostels and universities are a great place to start, but locals can be surprisingly open and friendly as well. Have you ever had a bad experience with revealing that you’re vegan? Let us know in the comments below! Dayton currently lives in Idaho, where non-vegan friends and family can be found in abundance. She has navigated this dangerous land for the majority of her life, and she enjoys potatoes just as much as you'd expect. Rediscovering Vegan Germany: Pea Meat! Just in right time: because, as new vegan, already with long time vegetarian husband, I get so many more or less polite questions, ideas, “advices” and “are you out of your mind?” And it was the hard way to learn that as a vegan it’s most unconvenient to get hungry out of the house. I love your advice on how to stay calm, friendly (and not hungry) in such situations. Great article, thank you, Wendy! I’m so glad you find the article helpful, Mari! And many thanks to our guest blogger, Dayton, for giving such great advice. BUT WHERE DO YOU GET YOUR PROTEIN!… is what i always hear from family members. I literally answer them now with “have you ever heard of someone dying of protein deficiency?” and walk away ! Thanks for sharing this some times its nice to know that others go through the same things and your advice is great!! Yes, the protein myth is definitely the most common misconception about veg diets. It’s a lie that our society teaches us starting in early childhood, and I used to believe it myself. I know how frustrating it is to hear it all the time, and walking away is sometimes the best response. But it’s also good if we can educate people, in cases where they seem to be open to hearing new information. I’m glad you found the advice in the post helpful! Yes, Yes, YES! To everything – YES. I’ve had friends wave food in front of my face as if tempting me with something I’m struggling to resist… I’ve struggled coming to terms with my boyfriend eating meat whenever he travels because “it’s hard to find vegan options”… realizing that many people just look at it as a temporary diet that we don’t “have to” adhere to. You should see my face!! People worry about protein and iron and B vitamins… they say, “Well, what CAN you eat?” It’s funny that underneath that reaction is an understanding that the traditional menu is largely ANIMAL based… but the rest of the connection is lost. Pets vs “food”. Anyway, it’s hard to be chill when EVERYONE else around me makes it an issue while I’m minding my own business… and you’re right, I have to explain myself over and over and over and over… ad nauseam. There’s a point where it goes beyond a genuine curiosity to learn about something new and it become passive aggressive. I don’t say what I really think because that would come across as judgmental… but the rest of the world gets to poke and prod and judge… and then accuse me of being judgmental when I answer questions asked of me. I really struggle with handling this. Your advice is very much on point, I just have to figure out how to stop letting it get under my skin. I’m glad to hear that the article resonated with you Jade, but of course I’m very sorry to hear about the difficult time you are having with the people around you. It’s tough being a vegan in a non-vegan world. By becoming vegan for ethical reasons, you are inadvertently reflecting a light back on them and reminding them that their own actions might not be in line with their values. That’s why they see you as judgemental even if you’re not; it’s really them judging themselves in the light of your actions. Disagree with taking the jokes in stride. People that are disrespectful should be politely put in their place. I do understand what you mean, Cara, and I too find it difficult to laugh it off when people poke fun at veganism. If putting those people in their place is what feels right for you, then I say go right ahead. I think the argument for taking jokes in stride is just that people who think of vegans as radical extremists might change their mind if they see that we can laugh about it. It’s a tricky area, though, and one where I think different approaches can work for different people. Thank you for a great article. After my family actually waved a steak on a fork in front of my face, I finally said, “You see a steak. I see an animal that wanted to live. “. You wouldn’t wave a beer in front of an alcoholic. Or bread in front of the gluten free folks. So what’s going on? I’m sorry to hear that your family members have reacted in such a negative way to your veganism. It’s most likely because you being vegan has triggered something in their own conscience, and that’s what they’re lashing out against. By saying that you don’t eat animals because it goes against your morals, you are implicitly saying that you also find their actions morally wrong, and so they feel judged. But that’s their own inner stuff that they need to work through. At the same time, you are perfectly entitled to set boundaries and ask that they show respect. As a mild omnivore, meaning I don’t eat a lot of meat, my only concern with your article is the judgmental phrase ‘some people are too headstrong or oblivious to deal with your veganism in the appropriate way”. It’s a two-way street. Omnivores often ask ‘how do you get your protein?’ For omnivores, it’s a valid question based many times on curiosity or lack of knowledge, and yet rather than simply naming some sources, the vegan becomes defensive or aggressive. Personally, people have a right to choose their lifestyle, diets, philosophies, religions so it makes no difference to me whether someone is vegan, vegetarian, omnivore, as long as they aren’t preachy. My body, my food. Their body, their food. I respect their choice to eat what they want, just as I expect them respect mine. The fact is, vegan or omnivore, we should all work together to improve all life on planet Earth, but it takes everyone, Vegan and Omnivore, to recognize they are complicit in the destruction of life and environment. Whether meat eater or plant eater, the waste is horrendous. The destruction of the environment to make bigger farms or ranches to grow more food creates death and extinction of many animals and species. We all have blood on our hands. No one is entitled to take the moral high-road on this issue. Vegans and Omnivores are not enemies. Once each side understands that the world will be a better place. I completely agree that it is a two-way street- just as omnivores should accept our dietary choices, we need to accept theirs as well. In my article, I specifically discuss how you should answer questions casually and take little jokes in stride, but I stand by my statement that “some people are too headstrong or oblivious to deal with your veganism in the appropriate way” because SOME people are. I’m acknowledging that not everyone will be accepting of vegans, as the commenters above had detailed. This is the sort of thing you have to be prepared for if you’re going vegan, just like if you were making any other significant lifestyle change you’ve got to be prepared for intolerant people. You’re right that SOME vegans are not accepting of omnivores either, and that’s not okay. Really, I’d say that most people on both sides are accepting. We don’t agree with the other side, but we’re respectful. This is what I’d like to encourage and see from omnivores and vegans alike. We shouldn’t let the intolerance on either side define us, but we should be prepared to deal with it. I support what Dayton said, and I’d like to make a couple of points of my own. I completely agree with you that “where do you get your protein?” is a valid question and that vegans should be patient when answering it. I also agree that we should all work together to improve all life on planet Earth, and that we are all complicit in the destruction of life and the environment. For myself and many other vegans, this is, in fact, a primary reason for choosing this lifestyle. Choosing to eat plants over animals is the single most impactful thing that we can do to minimize our footprint on the Earth. If you have not seen the film Cowspiracy, I strongly encourage you to watch it, as it explains in detail how animal agriculture is the number one cause of environmental destruction. I know that I still cause some harm and that vegans aren’t perfect. Veganism isn’t about being perfect; it’s about doing the best we can to cause the least harm. I’m sure that you also do things to lessen your eco-footprint, and I can certainly respect those choices and can respect you as a person. I cannot, however, respect your choice to willfully cause harm by eating an animal. Your assertion that it’s “your body, your food” would be valid if yours was the only body involved. But where you see “food”, I see the body of an animal who was completely innocent and who wanted to live. This is not about you or me; it’s about the animals. You seem to see the choice of who or what you eat as a personal choice, but choices are only personal if there is no victim. I’m 47 years old,been vegan for 26 years,best choice I ever made.I thank all you vegans/vegetarians out there for your existence. Your last response to a commenter is spot on. Most of my previous friends are vegan,but the friendships ended due to incompatibility issues.Now all my friends are non vegans/vegetarians and I get along with them better,but they can’t relate to the” vegan thing” at all and are sometimes disrespectful.It’s tedious,but for the most part I like these people and understand their level of consciousness on the issue(they just don’t understand mine). It’s strange that other vegans don’t necessarily make better friends. My partner is a long time vegan also,which makes life better,but it’s nice to have compatible friends too. I’m vegan for ethical reasons mainly,the health benefits are an added bonus.It’s deeply saddening the brutalities animals are forced to suffer needlessly and endlessly.Once the truth has been seen,it cannot be unseen.This fundamental lack of compassion has consequences in so many other aspects of existence on this earth. Thanks so much for sharing your experiences as a long-time vegan. It’s great that you are able to maintain good friendships with non-vegans despite the fact that they don’t fully understand your motivations for following a vegan lifestyle. You are setting a good example for them and have probably had a more positive influence on them than you realize. I got here because I have a dilemma, my spouse became a vegan quite a few years ago and a few years ago I switched to being a vegan, mostly because it’s very important to her and I wanted to be a good partner and support her. The problem is she is absolutely intolerant of non-vegans. This has caused a lot of conflict despite family and friends going out of their way to prepare vegan dishes for us (which I think is thoughtful and considerate). If there are any animal products served or consumed in her presence it becomes a referendum on their morality and she becomes deeply offended they would consider consuming an animal product while she was present in the house. My interpretation is entirely different, the fact they went out of their way to include us and cater to our choices shows love and respect, but she sees it as an affront. If we go out to eat in omnivore restaurant she’ll whisper “look at those disgusting people next to us”, but all I see is a nice family enjoying a meal together. She refuses to attend any social event with me where non-vegan food is served claiming she just can’t tolerate it. It basically means we can’t socialize with the other 95% of people in our community. I’m desperate because I’m tired of the conflict and I want to socialize with other people. But she is an absolutist and militant activist who views compromise as capitulation. I don’t even know how to address this with her because I know the moment I suggest she be more tolerant she’ll rant, accuse me of disloyalty and insist the only way the world will change is if we demand it changes. I’m tired and exhausted by this and I’m about ready to throw in the towel. But if she can’t overcome her anger and frustration with non-vegans, and if you want to save your marriage, then the next best option is to expand your vegan social circles and look for ways to socialize that she is comfortable with. Facebook groups and Meetup.com can be good resources for finding vegans in your area. My heart goes out to both of you, and I hope that she is able to find peace and to feel compassion for human as well as non-human animals. Thank you Wendy for your thoughtful and considerate reply, it is appreciated. I watched Jade’s video and it’s a good resource to work with. I found it interesting the position I’ve taken which I call “lead by example” as opposed to “bludgeon with a stick” is essentially what is advocated by Jade. Just follow the vegan lifestyle without active intervention and allow others to observe and come to you when they are ready to learn more. Trying to force your views on others is never successful and our world has already suffered too much from zealots of whatever persuasion you choose. Interestingly you suggested becoming involved in vegan social circles. We are fortunate to live in a location with a very active vegan population and numerous vegan eateries. These vegan groups form the majority of our social interaction (although I would prefer a wider circle). In addition to the vegan social groups my wife is also very involved in activism, something I choose to avoid. All of this is to say being insulated from others and living within a vegan bubble is not necessarily healthy in my opinion for a variety of reasons. But foremost among those reasons is you live in an echo chamber of like minded people who reinforce your views, chief among them is intolerance of others. I see the same social pathology playing out in political discourse and it’s very damaging. If we could just lose the anger, accept others and bring others into the fold by leading by example it would be a much more successful strategy and avoids all the debilitating heartbreak and stress that is the byproduct of confrontation. I’m glad you found the video to be helpful. Yes, I do know what you mean about living in an echo chamber. I meant that suggestion as a kind of backup plan, but I agree that the ideal would be to widen your social circles to include people with different backgrounds and viewpoints. I do think that leading by example is often the most effective form of activism, though I don’t discourage people from engaging in other forms if that’s what feels right for them.